Cherry Hill, NJ – “Do you know how old this church is? This church is older than many of your Yiayias and Papous”. 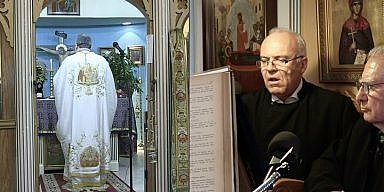 With these words, Father Emmanuel Pratsinakis of St. Thomas, began his dialogue to a flock of more than 160 students and their parents yesterday at St. Thomas Greek Orthodox church in Cherry Hill NJ. With great big smiles, mothers and fathers alike flooded into the church, lit candles and took to the pews yesterday afternoon for a traditional Agiasmos ceremony (blessing) before heading off to see their classrooms and meet their teachers. But the real story here is the growth of the student population the last several years, as told to us by Principal Panagiota Delimaris of St. Thomas. Delimaris said, the classroom attendance in the 1st, 2nd and 3rd grades has grown larger than the upper grades and that the kindergarten class has grown by nearly 40% compared to previous years. 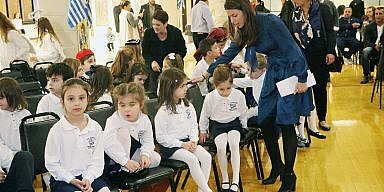 This year kindergarten class size went from 27 to more than 38, adding another classroom to the Greek school. St. Thomas’ Greek Orthodox church, history lies in Camden, NJ. It moved to it’s current location in 1967. At one time more than 170 students attended the school at once, before a drop off in the 80’s and 90’s. Now, the new addition, John Ballis Hellenic Educational Center appears to be in full use. making St. Thomas Greek school the largest in the South Jersey area.